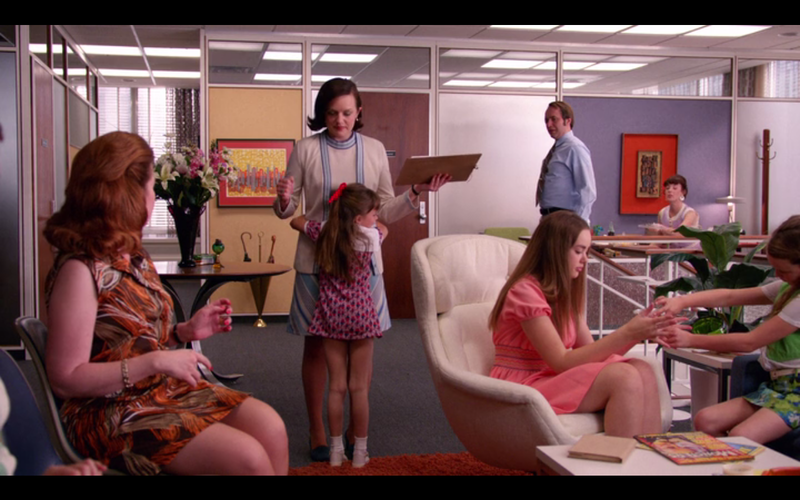 Mad Men’s first season ended with Peggy receiving a promotion from secretary to junior copywriter and then promptly giving birth to a baby she didn’t know she was carrying. The decision she made after that, to carry on with her career and give the baby up for adoption, has come to define her character for the rest of the series. Peggy didn’t arrive at Sterling Cooper with big dreams about a career in advertising. The girl we met in the pilot was fresh out of Ms. Deaver’s Secretarial School, naive, smiling at the suggestion that she might meet a husband at her new job. Peggy wasn’t thinking about pursuing copywriting, she was coming on to Don on her first day, enjoying the attention of Ken and Kinsey and, of course, Pete. But by the end of the first season Peggy had started to see a different life for herself. She walked through the door that Freddie Rumsen opened for her when he heard potential in the phrase “basket of kisses,” and she found a dream she hadn’t expected. Everything Peggy has done since has been in pursuit of that dream. Whether she was taking Joan’s advice to “learn to speak the language” and “stop dressing like a little girl,” or watching and emulating the way Don speaks back to clients, she has consistently directed herself towards the future she laid out for Don in last week’s episode, the one where she’s SC&P’s first female creative director, succeeding the man who helped get her there. The future where she’s created a catchphrase and attained the fame that comes along with it. The future where she’s built something meaningful in advertising. Peggy’s dreams have only grown as the world has opened up to her. The world of her career, anyway. Because alongside her ascent in her professional life we have seen the descent of her personal life. Peggy’s mother and sister have drifted off-screen over the years, as she moved out of Brooklyn and away from her Catholic upbringing. She’s had a few boyfriends who weren’t quite the right match, a couple of affairs with older male co-workers. She went on her most promising date in seven seasons a few weeks ago and came out of it more embarrassed than excited. The most significant relationships in her life seem to be with Don, her mentor, Pete, the man who got her pregnant and her uneasy ally, and Stan, her best friend, maybe the only real friend she has at SC&P. Contrast Peggy’s life to Trudy Campbell’s. The morning after Pete was seducing Peggy, way back in the pilot, he was marrying Trudy. Trudy’s path was far more traditional than Peggy’s. She made what she believed to be a good match, marrying a man she loved, with an impressive family name, and a career he was passionate about. She took on the role of housewife with enthusiasm. But gradually the reality of a marriage to Pete wore away at her. Their years of infertility, his pride and infidelity and dissatisfaction, and the temper that is always close at hand, all brought their marriage to an end before the 1960s were over. Like Helen Bishop back in season one, Trudy is a divorced single mother in the suburbs, a woman who can’t get her daughter into an elite preschool, the object of her friends’ husbands’ attention. She’s a throw-back. In last night’s episode, “Time & Life,” Peggy told Stan about her decision to give up a child, the first person we’ve seen her tell since Pete, all the way back in season 2. She tells him because they’ve been casting kids all day, pulling her out of her comfort zone, and because he’s just witnessed her throwing down with a stranger over her parenting methods. But she also tells him because she’s reached another turning point in her career, the opportunity to either replace SC&P with another small agency or go big at McCann, reframe her future on a grander scale, and it’s got her looking backwards at where she’s been. At the life she exchanged for the one she got. The theme of the unlived life has been coming up again and again this half season, and now it’s Peggy’s turn to look around her and see what could have been. It’s hard to imagine Peggy as the stage mother she confronts in “Time & Life,” the encounter that prompts her confession, but the audience is privy to something a bit closer to Peggy’s might-have-been: the scenes between Pete and Trudy. If Peggy had chosen differently at the end of season 1, if she had kept her baby and shamed Pete into leaving Trudy and starting a family together, as she suggested she could have when she told Pete what happened, she still wouldn’t have ended up as Trudy precisely. Their personalities are different, their backgrounds are different, the way that they relate to Pete is different. But Peggy would still have been a woman who set aside her career to be a mother and a housewife. Pete would still have been angry and unhappy and resentful. There’s every reason to believe that Peggy too would have ended up a single mother. But that’s the thing about the unlived life: there’s no way to know for sure. Peggy made a choice and in making it it became her only choice, she can’t go back on it. She can only look ahead to her next decision, in this case a lateral move or a big leap forward. Could the Peggy we know have decided to do anything but leap?